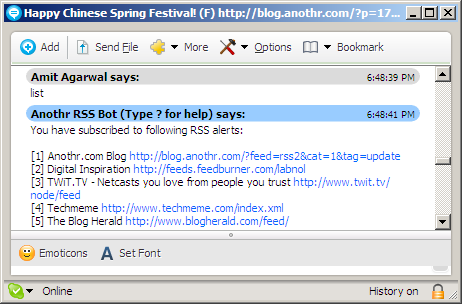 Anothr.com is sort of an RSS reader for Skype but very useful - as soon as a new post is published on your favorite blog/RSS feed(s), you are notified almost immediately via the Skype Chat window - no registration or downloads required. This service will be handy for users who have Skype running in the background at all times. Like IMified, you first have to add Anothr.com to your Skype buddy list and then type in the website / feed addresses that you want to subscribe. If there's a new post, Anothr.com will automatically open a Skype chat window and show you the text of the new post as an IM. How cool. Maybe it's time to unsubscribe from those breaking news alerts from BBC and CNN that hit your email inbox, just add these sites to Anothr.com and Skype will do the job for you just fine.